One of the appointed scripture readings for Sunday was 1 Corinthians 12, which speaks about the variety of spiritual gifts that are given to individuals within the Church. “Now to each one the manifestation of the Spirit is given for the common good,” says Paul, and the goal of our service that day was to provide space for each person’s gifts to be shared. Rather than the typical sermon, we invited anyone who felt led to share – whether through art, or music, or a testimony, or a poetry, or any other gift. And share they did. Two of the men who were present shared songs they’d written themselves. Two women shared pieces of artwork they had created, one of which was based on the vision of heavenly worship presented in Revelation 4. The other (shown here) is of a dragonfly. In the artist’s statement about the piece, she explained the traditional Navajo belief that dragonflies symbolized pure water. 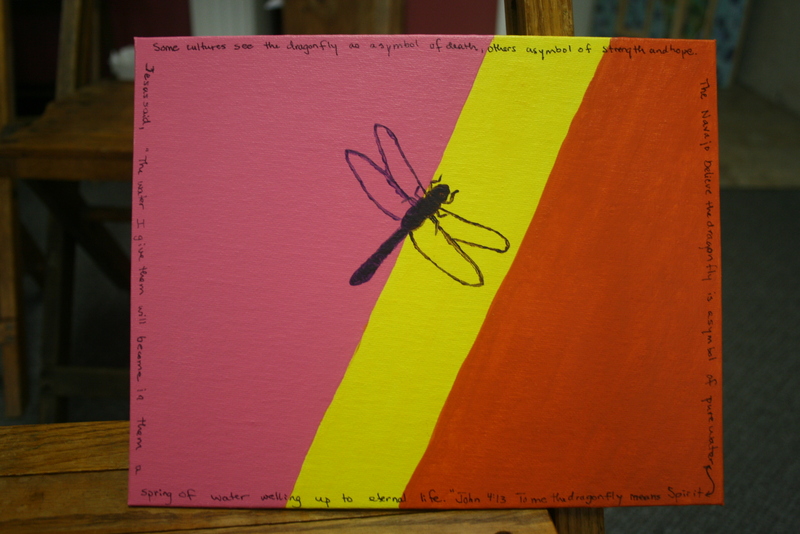 She used the dragonfly then to symbolize the living water of the Holy Spirit welling up inside her. Two other people shared personal stories of how God’s been at work transforming their lives. One of these stories was a moving testimony from a woman who has suffered much, sharing that she now believes her God-given purpose in life is to encourage others who are suffering. I left the service feeling so proud of our little congregation. God has brought some amazing people to Upper Room, and God is continuing to bring more people with a variety of gifts and incredible stories. I think the Holy Spirit is up to something here. And I am rejoicing.